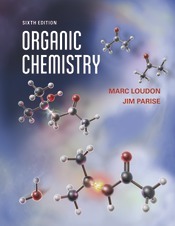 Loudon and Parise's Organic Chemistry is known for its clear writing, high standard of accuracy, and creative problems. This edition contains over 1,800 problems—many of them new and taken directly from the scientific literature. The book is used at a wide variety of schools, such as UC Berkeley, Caltech, Colorado, Cornell, Duke, Harvard, Illinois, Maryland, Purdue, Yale, Wisconsin, and many more. This edition provides students with more health examples drawn from modern medical practice, as well as many cutting-edge topics from modern synthetic organic chemistry. In addition to the printed book, students can rely on Sapling Learning’s online homework platform for extra learning and assessment. The platform offers automatic grading, an easy-to-use interface, and instructive feedback. Instructors can select from a variety of existing problem sets—over 1,000 of Loudon's problems are in the platform!—or they can modify the questions or author them from scratch. Not only does the software allow students to easily draw and interact with structures, it allows them to draw entire reaction mechanisms, including showing the movement of electrons with curved electron arrows.